Is Downtown San Carlos Becoming Restaurant Row? Possibly. On Laurel Street alone there are nearly 50 shops serving their very best creations to local shoppers. This does not include the additional 15 found on San Carlos Avenue and El Camino. The bottom line is that food has become the focus of downtown San Carlos. Just a brief scan of the changes over the past month show an influx of new eateries, including Lulu’s, La Corneta Taqueria and Zest Bakery. San Carlos has come a long way since the days of the Hot Dog Factory being the king of the Laurel Street restaurants……and that wasn’t too long ago. The transformation has been fast and furious. The remaining questions will center around how the sudden explosion of restaurants will affect San Carlos. Start with the premise that any additional dollars being spent in San Carlos is a good thing. Out of town dollars being spent in San Carlos? Even better. Any negative issues stemming from the recent surge in activity are all secondary in nature. Parking, congestion and infrastructure are all issues which will need attention. The City of San Carlos has begun to put some preliminary plans in place as the once sleepy downtown transitions to a destination for those who live beyond the city limits. The prospective redesign of Wheeler Plaza will play a huge role in the new downtown. Wheeler Plaza is located behind the shops on the south half of San Carlos Avenue, between Laurel and Walnut. The new plaza will have retail shops and additional parking. The design will also make the plaza flow more easily to downtown. San Carlos seems very focused on keeping a village feel to downtown. The City’s ability to keep most of downtown in the hands private business, rather than nationwide chain stores has helped preserve the independent nature of Laurel Street. 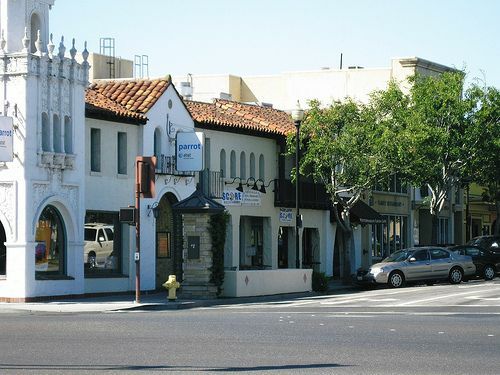 Believe it or not, downtown restaurants also provide a boost to San Carlos real estate. Many clients that I have had said they never really even considered San Carlos as an option until the day they happened to come here to have lunch or dinner. They became intrigued, investigated further and ended up focusing their entire search on San Carlos. Live in San Carlos for any amount of time and it is almost impossible to go downtown without running into at least three different people that you know. The only difference for San Carlans in the coming years will be learning to share their downtown with others. I think so. Recently heard a friend say that her girlfriend who lives in Burlingame now dines in San Carlos “to be seen” ! Clearly Downtown San Carlos and the shops and restaurants here have arrived. Unbelievable! When I left San Carlos to face the world in the early 70’s, there were only 3 restaurants on the 600 through 900 blocks of Laurel. Orchid Room, Al’s Cafeteria and an Italian eatery on the corner of Laurel and Arroyo. SCHS class of 1965 will be having their 45th reunion this October. I think I will convince the group we need to descend on San Carlos for lunch one day. I just moved to San Carlos about a year ago, but have lived ont he peninsula all of my life and remember when San Carlos was a place where the sidewalks rolled up after dark. Although once the sun goes down less of the sidewalk rolls up these days, there are parts of Laurel mainly the southern portion past Howard, where it is still dark and sleepy. My question to Bob and anyone else is, are there any plans to expand the resteraunt row currently ammassed in one central area to the more sleepy southern tip? Also, I do not think having a chain stor presence in the downtown will affect the feel or look of a village that San carlos is going for, afterall, La Boulangerie is a chain and they seem to have fit in just fine. The restaurants are spreading south of what is known as the Downtown core (first three blocks of Laurel – 600 thru 800 blocks) already. A good example are the places on the 900 block of Laurel: Refuge and the new Flight Lounge wine bar. Another is Mack’s BBQ which is now in the 1700 block of South Laurel which formerly housed Micha’s. As the Downtown Core locations continue to rent up quickly, we’ll likely see more restaurants head further south. A nice spin-off effect of the strength of these businesses in the downtown! In the recently adopted General Plan 2030 there is an emphasis put on South Laurel. The General Plan calls for Regional Retail (Trader Joe’s, Walgreen’s, etc. ), mixed-use housing, and the same sort of retail that is seen in the first 3 blocks of Laurel. The General Plan Advisory Committee wanted to protect the local feel of the first three blocks of Laurel, but allow a newer version of Laurel street to grow south of the Historic 600-800 blocks. We are getting ready to move to San Carlos from East Coast, super excited to try out all these great restaurants and hoping the ‘restaurant row’ area continues to evolve. What are some of the best options in Downtown? will put those at top of our lists!